Applications for the 2018 Sustainability Pitch Competition will run to midnight Oct. 20. 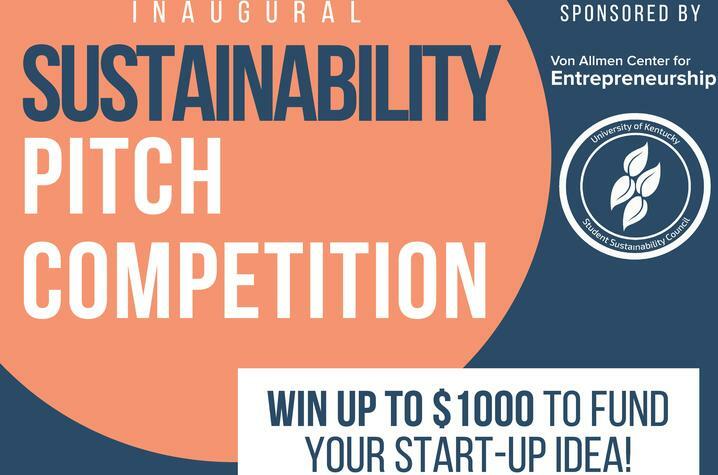 LEXINGTON, Ky. (Sept. 21, 2018) — The Von Allmen Center for Entrepreneurship, part of University of Kentucky’s Gatton College of Business and Economics, is co-sponsoring the first-ever Sustainability Pitch Competition this fall. The online application is now open for teams interested in pitching their sustainable startup idea to a panel of judges. The startup idea must be related to one or more of the three pillars of sustainability: environmental, economic and social. Business ideas can be for profit or nonprofit. A total of $2,000 will be awarded to the top three finalists, with the first-place team receiving $1,000 to help make their startup a reality. Teams can be made up of a maximum of four people, with priority being given to teams having at least one member who is a current undergraduate or graduate student at UK. Teams must complete their application and submit a video up to three minutes in length explaining their startup and how it relates to sustainability no later than midnight Saturday, Oct. 20. Finalists will be announced on Monday, Oct. 22. One or more team members must be able to attend the competition finals, which will be held 7:30 a.m. to 2 p.m. Saturday, Nov. 10. The online application can be found at: https://uky.az1.qualtrics.com/jfe/form/SV_6JO8m8VMsQPLSUl.